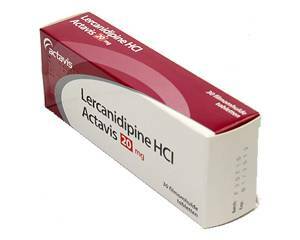 What is Lercanidipine used for? How do you use Lercanidipine? Lercanidipine is a medication that is classified as a calcium channel blocker: drugs that dilate blood vessels and lower blood pressure. Lercanidipine is prescribed by doctors to treat high blood pressure when other blood pressure lowering drugs do not work (well enough). Lercanidipine should be taken at a fixed time (preferably in the morning) and always at least 15 minutes before eating. Note: grapefruit may enhance the effect of this medication. Therefore do not eat/drink grapefruit (juice) if you are being treated with this medication. Lercanidipine is available in tablets of 10 and 20 mg. The doctor will know which strength is right for you. The usual dosage for adults aged 18 and over is one tablet once a day. Always follow the advice of the doctor. A missed dose may still be taken, unless it is almost time for the next dose. An overdose may cause a very low blood pressure, a rapid heartbeat or cause unconsciousness. Always warn a doctor in the event of an overdose. A complete list of contra-indications is listed in the leaflet. Little is known about the effects of Lercanidipine on (unborn) babies. Therefore this drug should not be used if you are pregnant or if you want to become pregnant, or if you are breastfeeding. Talk to the doctor if you are taking any of these drugs or other medications. Lercanidipine may sometimes cause dizziness or drowsiness. Once your body is used to a lower blood pressure, these symptoms usually disappear. Then you should be able to participate in traffic again. Alcohol increases the effect that Lercanidipine has on the blood vessels. This may increase, or worsen, dizziness. Keep this in mind if you want to drink alcoholic beverages.